This release takes a further stride toward bliss's rule based music management vision. 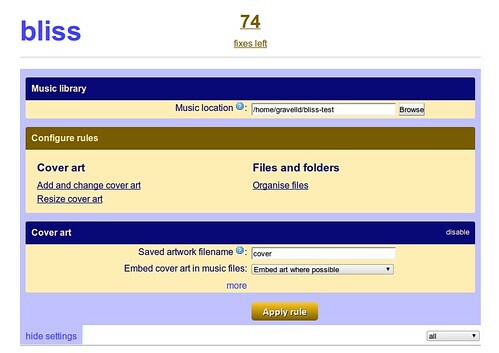 I've made it easier to enable the file organisation rule plus it is now possible to disable the album art rule. Thus, if you wanted, you could now just use bliss for music file organisation. Now, a couple of changes for the album art rule. Given some user feedback I changed the way album directories are recognised. Before, when deciding whether to save a co-located image (e.g. a cover.jpg or folder.jpg in the album directory) the album name was compared to the parent directory, and if it didn't match enough it did not save the file. This is to ensure such files are not saved in 'miscellaneous' grouping directories of tracks. Now, the album name is compared to the other tracks in the directory instead, and if they are all similar enough then the file is saved. The second change to the album art rule is that the details of why an album was compliant/uncompliant in the overview screen has been trimmed down so you don't get a load of cropped text that is frustrating to read. Instead, whatever was compliant or not, such as "Embedded" or "Size", is listed with a click through to see more detail. I also fixed the Windows installer - before if you reinstalled over the top of a previous installation of bliss you got a nasty 'EOFException' when installing. Finally I spent a little time beginning the help pages for bliss. They are a little thin right now, but I intend to work on some walkthroughs/demos/howtos over the coming months and also some more 'reference material': describing the screens of bliss. A big challenge is to work out how/whether this should be shared with the bliss application itself.